The owners and maintenance experts of Universal Auto Center have been honored to serve Woodlake and Galleria for the past 16 years and many more to come. While we focus on Auto Repair, Engine Repair, Brake Repair, Transmission Repair and Auto Electrical Service, we also provide a long range of other auto repair services listed on our services page. 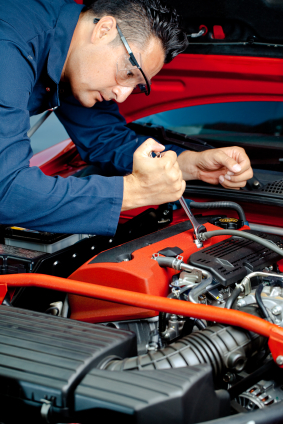 Our auto repair experts have built our reputation by superior service here in Woodlake and Galleria. "I highly recommend Universal Auto David is wonderful, I was debating buying a new car or rebuilding my paid off car, David quoted me a price and stuck with it even when more work was discovered. I now have a rebuilt car that runs great and is guaranteed with every part. They are very fair and honest and provide great work." "I had to take the time to write this review because I have honestly never been as happy with a repair shop as I was with this one. They are amazing! Anna was extremely helpful in getting me taken care of. Rojas explained everything to me and was so very nice. I am so glad that I found this place and I will be back! Thank you so much Universal!" "My first impression came when I heard David speaking with another customer. He mentioned that they work to identify the problem and then see how best to fix it, not just throw new parts at the problem. I liked his vibe and attitude right off the bat." "Friendly professional service. The work is done right, at a fair price and only the work that needs to be done is recommended." "I was very dissapointed to find spilled soda in the cup holder of my very recently detailed car, a restaurant reciept, sunglasses that did not belong to me in passenger side door, my recently filled gas tank was emptied, and according to the oil change paperwork I had from two days prior to drop off, over 100 miles had been added on to my car."